Blue Ridge, Ga. – Volunteers and staff welcomed visitors to the Fannin County Animal Control (FCAC) facility on Saturday Oct. 27 to showcase the positive improvements being done and of course, the wonderful dogs being housed there. 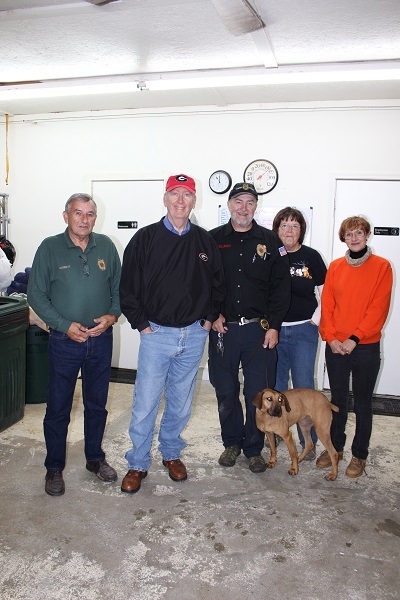 Present to discuss future plans for FCAC are left to right: Animal Control Officer Junior Cornett, Fannin County Chairman Stan Helton, FCAC Department Head John Drullinger, volunteer Diane Head, and volunteer Patrice Noble Epps. It was a crowded house as residents and visitors got to peek inside the FCAC facility and speak with the staff and volunteers about ways they can contribute to this community service. This year the facility has seen upgrades in the likes of outdoor runs attached to the indoor kennel areas. The Fannin County Board of Commissioners approved funding for this project after speaking with FCAC Department Head John Drullinger on the impact this addition would have not only on staff safety but also for the quality of life of the animals. Beyond improvements to the building itself, the recent movement of community volunteers taking action to help out in anyway that they can has had major impacts. Volunteers come on a daily basis to walk dogs, clean kennels, and offer services in their areas of expertise. Some choose to take photos to help spread the word via social media about the adoptable animals at FCAC and others have even proposed using their artistic skills by offering to create a mural at the facility. 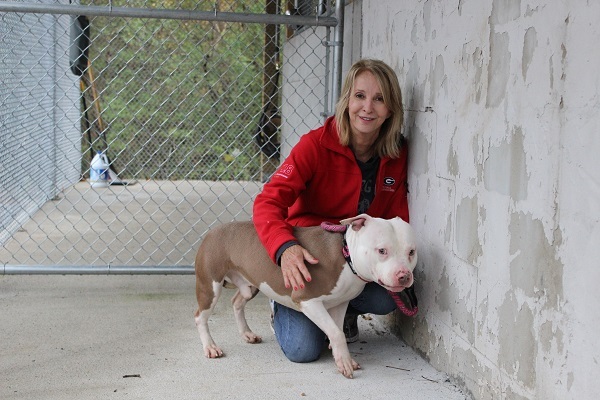 Patrice Noble Epps is one of the volunteers that loves spending her time working with the animals and crew of FCAC. Debbie Harbin, Co-owner of Treo Blue Ridge and regular volunteer, stopped by to introduce FCAC dogs to visitors at the open house. The volunteers and staff have been working together to create more changes, both Drullinger and Noble Epps spoke of the recent addition of a sponsorship program. This program accepts monetary donations from the public and these donations are being used to vet the dogs at the shelter. Vetting includes spay/neuter, heartworm testing, rabies vaccination, and microchipping. During the open house several residents stepped up to donate to this program and sponsor the dogs. Noble Epps would also like to see donations provide training for the shelter dogs being adopted. “You could adopt the dog and then you go and you have a training class where you learn how to handle a shelter dog,” Noble Epps explained how the option of a training class would work and stressed that the dogs that have been there the longest would benefit the most. Another improvement that seems to be on the horizon for the FCAC facility is the addition of an onsite outdoor play area for the shelter dogs. This area will be modeled similar to the dog park that is currently offered by the Humane Society of Blue Ridge, but be used by FCAC dogs only. And making it better she has, as well as all the other volunteers who have donated their time and talents. There is no denying the excitement and enthusiasm that is being brought to FCAC through the volunteers and the building upgrades. It is the hopes of all involved that this positive momentum will continue to increase well into the future. BLUE RIDGE, Ga. – Animal activists and concerned citizens had their voices heard at the Nov. 14 Board of Commissioners meeting. After a viral post on Facebook concerning two at-large German Shepherds ended in the dogs being falsely claimed at Fannin County Animal Control (FCAC), concerns over FCAC policy and procedure became a topic of discussion in the community. German Shepherds found at the Blue Ridge Post Office. Commissioners were met with several residents ready to voice their concerns over animal control and over allegations made that Commission Chairman Stan Helton showed indifference to the situation. Jan Eaton herself spoke out about the indifference she felt she faced when trying to discuss issues regarding animal control. Eaton had asked to be put on the agenda to have more time allotted but had been turned down. Eaton also addressed the mistakes made in following policy at FCAC when it comes to owner reclaims. She stated that the current policy only requires that proof of rabies be brought for dogs to be released. A resident of McCaysville also spoke of policy at FCAC. He proposed that animal control make it standard to take a photocopy of the driver’s license of the person claiming a dog. He stated that it would be a way, if need arose, to track down the person who picked up the animal. Ask the person attempting to reclaim the pet if they can provide photographic evidence of ownership. 1. Make a copy of the driver’s license of the owner. 2. Photograph the vehicle the owner is picking up the pet in, regardless if it is the pet owner’s car or not, be sure to include an angle showing the license plate or include a separate photo of the license plate. These revisions to the policy are not finalized and are still under review. Also stepping up to try to provide a solution is the Humane Society of Blue Ridge (HSBR). A letter was sent out on behalf of HSBR describing their concern for recent events involving FCAC and the ongoing issue of stray and lost dogs in Fannin County. 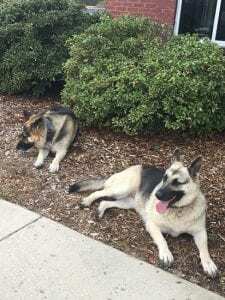 BLUE RIDGE, GA – What started out as a good Samaritan’s post on Facebook trying to locate the owners of two at-large dogs, later turned into a search to locate the stolen canines. The two German Shepherds located at the Blue Ridge Post Office. Fearing for the animal’s safety, Fannin County Animal Control (FCAC) was called to retrieve the two dogs. FCAC received a call at 11:59 a.m. and was on the scene within 10 minutes. The animals were able to be contained and were immediately driven back to the Animal Control building located at 1001 Fannin Industrial Park in Blue Ridge. According to FCAC records, a call was received within 20 minutes of having retrieved the animals, and the woman calling was claiming to be the owner of the dogs. After coming to the shelter to give information for owner reclaim records, FCAC released the two canines to the woman who had previously called claiming ownership. After this release, however, another couple stepped forward claiming ownership of the two German shepherds. Drullinger is working to amend FCAC’s policy regarding owner reclaims. Once the policy is amended, it could take effect immediately. County Chairman Stan Helton was made aware of the situation but is currently unable to discuss the specifics of the ongoing investigation. The dogs were last seen with a woman driving a dark gray newer truck, possibly Toyota. According to open records at FCAC, she left the name Kay Gentry. If you have any information about the location of the two German shepherds, you are asked to call Fannin County Animal Control at 706-632-3845 or the Fannin County Sheriff’s Department non-emergency line at 706-632-6022.